There's a lot of violence in movies and TV shows. Guns, blood and murder are welcomed into the family living room by the bleary eyes of desensitized souls. But it's entertaining! But it's also pretty ridiculous how un-shocking it is to see. We can pass violent ads without giving it a second look. This artist wants us to hilariously think different. Artist Jon Burgerman makes a commentary on the violent ads of movies and TV shows in his series Head Shots. 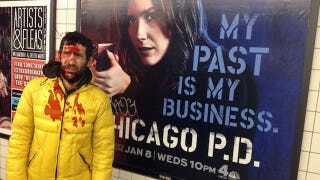 He poses in front of those gun-wielding posters and acts as if he's been shot in the head. It's purposely comedic but it also highlights the amount of weapons we see in our daily life. Where possible I will continue—the project is part of an on-going part of my practice of what I call a 'quiet intervention', where subtle, often cheap, non-permanent actions drastically (and sometimes comically) alter the reading of a signifier, object or situation.